Product prices and availability are accurate as of 2019-04-22 08:30:50 EDT and are subject to change. Any price and availability information displayed on http://www.amazon.com/ at the time of purchase will apply to the purchase of this product. This course shows you how to build data pipelines and automate workflows using Python 3. From simple task-based messaging queues to complex frameworks like Luigi and Airflow, the course delivers the essential knowledge you need to develop your own automation solutions. You'll learn the architecture basics, and receive an introduction to a wide variety of the most popular frameworks and tools. 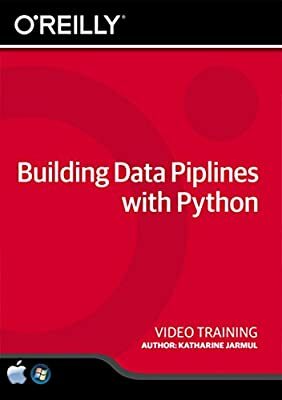 Designed for the working data professional who is new to the world of data pipelines and distributed solutions, the course requires intermediate level Python experience and the ability to manage your own system set-ups. Learn Building Data Pipelines with Python from a professional trainer from your own desk. Visual training method, offering users increased retention and accelerated learning Breaks even the most complex applications down into simplistic steps. Easy to follow step-by-step lessons, ideal for all Comes with Extensive Working Files!